HJ: Profound personal change can happen in an instant. The simple decision to let go of something that no longer serves you can massively impact the quality of your life for years to come. And on the other side of that change there is more happiness, health, peace of mind, abundance, fulfillment and joy than you could ever imagine. With the New Year upon us, many people are in the throes of their resolutions. Resolutions feel like such a burden to me, so instead, I switch it up and think about what I need to stop tolerating. 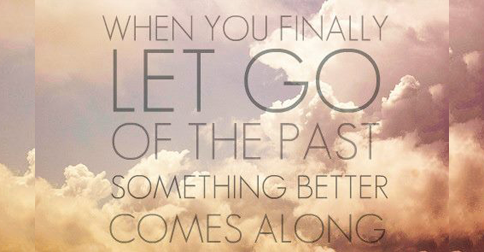 Letting go of unwanted things in my life makes me feel lighter, happier and more productive. Here are 15 things to let go of in 2015. I had a little help from my Facebook friends in putting this list together. Being a selfless giver. You might be wondering, is it really possible to give too much? The answer is yes. In his book Give and Take, Adam Grant discusses the differences between givers, takers, and matchers. He has discovered a number of different sub-sets of givers, two of which are “selfless” givers and “otherish” givers. Selfless givers give their time and energy without regard to their own needs (hey – it’s 3pm and I haven’t eaten yet today!). Selfless giving, in the absence of recovery, becomes overwhelming and can drive burnout. The trick is to become more of an “otherish” giver. Otherish givers find a way to balance giving with their own self-interest and self-care. Mindlessness. I think of mindfulness as a pathway to increase the space between a stress producing event and your reaction to it. If you’ve been feeling less focused, more scattered, or having more knee-jerk reactions to stress producing events, try the 4-7-8 breathing technique, which I learned from my colleague, Renee Jain. Sit in your chair or on the floor with your back straight. Breathe in for a count of 4, hold your breath for a count of 7, then exhale for a count of 8. The first few times I tried it, I was all over the place, but now I’ve got the hang of it, and it really helps. Bragging about how busy you are. When someone asks me how I’m doing, I’m going to fight the impulse to respond with “busy.” That word doesn’t really say much, and quite frankly, it’s probably not even all that accurate. I explore the connection between our “crazy busy” culture and burnout in my new e-book, Addicted to Busy: Your Blueprint for Burnout Prevention. What I’ve discovered is that being busy isn’t a bad thing as long as it’s purposeful and intentional, but too many of us fill our lives with unessential tasks in order to feel important and responsible. Low-quality relationships. This was a resounding theme among my Facebook gang. Many of us are just plain tired of being around people and in relationships with people who don’t have our best interests at heart. Low-quality relationships are marked by a lack of trust. According to my colleague Gretchen Pisano, trust is about four things: (1) common ground (we have similar values and objectives); (2) predictability (I can predict your behavior); (3) consideration (you will take my needs into consideration before you act); and (4) forewarning (you will tell me before you act in a way that is not in my interests). According to researcher Jane Dutton, high-quality relationships offer four things: respectful engagement, task enabling, trust, and play. I have used both of these tests to start weeding out the low-quality relationships in my life, and I already feel lighter because of it. Inauthenticity. Do you feel comfortable showing up in your life as you – warts and all? Authenticity is hard for many people because it requires vulnerability. The soldiers who I worked with really helped me to become more comfortable showing up in life as myself, and that has opened many doors for me. Acting without intention. My word for the year is “intentionality.” Acting with intention means being mindful of the choices you make and will require you to say no – a lot. I realize that saying no is hard, but so is running yourself into the ground doing things you don’t really like or care about (see selfless giving above). Some of your e-time. E-time is the amount of time you spend on your various electronic devices. One of my Facebook friends is letting go of 50% of his Facebook time in 2015, and I think I might follow suit. How many relationships, interesting conversations, and business opportunities have you missed because you were glued to your screen? Physical clutter. Physical clutter is constricting – I say this from experience as I’m about to be swallowed up by the papers on my desk and on my office floor. I’ve heard from many of you that you are going to donate clothes you no longer want, ditch all the paper, and create an ongoing organizational system. Mental clutter. There are a number of different mindsets and messages that we tell ourselves on a daily basis. Which ones help push you toward success, and which ones zap your resilience? For example, if you tell yourself, “I’m not good enough” when a challenge arises, what impact is this thinking having on your life? What would be the result if you thought something different? Being burned out. Burnout is pervasive and no profession is immune to it. I’ve summarized some of the key burnout statistics here, and it motivates me to continue to do this work. Burnout is a disease of chronic disengagement that impacts lots of areas of your life, and is marked by three big dimensions: exhaustion, cynicism, and inefficacy. If this sounds like you, there are tools and strategies to help. Inefficacy. Inefficacy is feeling like you can’t produce the results you want in your life. Inefficacy is one of the big three burnout dimensions, and the goal is to build more of its opposite – self-efficacy. Research points to three ways you can build more self-efficacy (Bandura, 1997): (1) have mastery experiences, which requires you to start tracking your successes, no matter how small; (2) have a few people to cheer you on and support you (see getting rid of low-quality relationships above; and (3) observe another person or people overcome challenges to achieve success, particularly if that person is accomplishing a goal you also want. Past failures, regrets & mistakes. This was another popular response from my Facebook group. Holding onto past failures, regrets and mistakes is like carrying around 100 pounds on your back. You can do it, but it slows you down and prevents you from getting where you want to go. My book writing coach recently told me that my platform wasn’t big enough to publish a book the traditional way and explained why. After getting quite mad at her and listing off all of my accomplishments over the past few years, I realized that there was some truth to what she said. Even though I stewed about this conversation for weeks, I decided to get honest with myself and then got busy fixing the issues. Other people’s expectations of you. It’s tempting to follow the expectations of others, especially when those “others” are close friends and family; but what is it that you want? What are you expecting from yourself? One strategy I use to evaluate expectations comes from Brené Brown. She talks about the importance of being “in the arena;” meaning, that if you are giving advice or criticism, you better also be putting yourself out there, taking risks and getting knocked around, just like I am. Perfection. Make this the year of “good enough.” And no, “good enough” isn’t about lowering your standards; it’s about choosing a standard that isn’t illusory. Perfectionists are more vulnerable to burnout (Aydemir & Icelli, 2013), and when it comes to making decisions, perfectionists experience a lot of regret, anxiety about missed opportunities, and often engage in unhealthy social comparison (see above about reducing your e-time) (Schwartz, 2004). Unhealthy habits. This could be anything from smoking, to drinking less, to losing those unwanted pounds. It could also be any one of the other items on this list. Change is never easy, but the results are so worth it. One of my favorite quotes is “One of the hardest parts of life is deciding whether to walk away or try harder.” Once you start letting some of these things go, hopefully the decision about what to do will become easier. What would you add to the list?